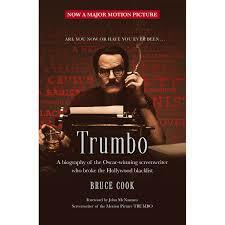 The film is an excellent additional text for the elective, particularly if supplemented with Bruce Cook’s biography TRUMBO (1977) which was recently reprinted by Two Roads to coincide with the release of the film. Starring Bryan Cranston (of Breaking Bad fame) as Dalton Trumbo, the film begins in 1947 as Trumbo is about to be questioned as part of the Hollywood 10 by the House of Un-American Activities (HUAC) about his membership of the Communist Party and his inclusion of communist propaganda in his films. 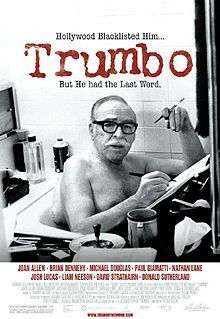 The film follows Trumbo’s Court strategies, his eventual imprisonment and his career as a screenwriter after he is blacklisted by the main Hollywood studios and beyond. The film is largely chronological in structure and requires some pre-knowledge of the events to better appreciate the significance of Trumbo’s courageous struggle. 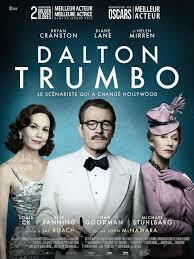 Cranston as the eccentric and brilliant Trumbo is outstanding. The best part of the film is how Trumbo tirelessly works under assumed names with the other Hollywood 10 and how they eventually break the ban in 1960. Although she is not mentioned in Bruce Cook’s bio, Helen Mirren is represented as the staunch but highly satirised anti-communist Hollywood gossip columnist Hedda Hooper. Bruce Cook wrote this bio in 1976 when Dalton Trumbo was an ill old man. Cook interviewed Trumbo and many of his contemporaries to piece together his life story. Cook would show up at their house and largely lets them tell their connection to Trumbo and what he was like. The writer of the TRUMBO film script, John McNamara, provides an insightful Foreward to the biography ‘THE BOOK AND I.’ He takes us through his love of the bio, the development of the script and the selection of the actors. The book, of course, details in far greater detail the events of the blacklisting of the Hollywood 10, but what stands out more than in the film is Trumbo’s tenacity, integrity, and in particular, his shrewd combatative nature in trying to deal with overwhelmingly powerful political forces of government. Trumbo (2007) is available on Netflix and on YouTube. It is based on the letters of Dalton Trumbo and directed by Peter Askin. It will add another layer to your understanding of this complex and exceptional man.